If you have a large room or open concept floor plan at your home, you might be wondering what the best diffuser is to really spread the essential oils over such a big area. If you’re looking at ultrasonic diffusers, you’ve probably seen 150ml, 300ml, 500ml and other size options (if you don’t know what an ultrasonic diffuser is, check this guide here). The capacity of an ultrasonic diffuser is more related to how many hours it will run rather than how big of an area it will cover. So you don’t have to get a larger diffuser for a large room if you are just running it for a couple of hours at a time. On the other hand, if you want to run it all day, then you’ll definitely want a 300ml or 500ml capacity diffuser. No matter what each diffuser company promises, there is a limit to how far the mist will travel. If you have a huge 1000 sq ft area then it’s just not realistic to expect a strong mist to cover the whole room from one diffuser. If you really want to cover the entire space, then your best bet is to just get two of the same diffusers and put the same oils in both and run them. Then you will get great coverage and don’t have to be disappointed by one diffuser not covering enough area. If you really want to cover a big room, then you definitely don’t want to be stingy with the amount of oil you add to your diffuser. A good ratio to go by is anywhere between 3-6 drops of essential oil per 100 ml, but if you’re diffusing in a large room then you should go on the heavier side. It can be very confusing to understand what size diffuser you have because the product will often say 300 ml tank capacity, but the measuring cup they provide you with to pour in enough water to hit the max fill line is only 150 ml. It’s very common to have a max fill line that is half the capacity of the tank size. A good guide to go by is if you have a 300 ml diffuser that will use 150 ml of water, then you should use around 10 drops of oil. If you have a 500 ml diffuser then you should go ahead and load it up with 15-20+ drops of oil. You can always go a little over or a little under these recommendations. Remember to get creative with your blends and use different oils in your diffuser. 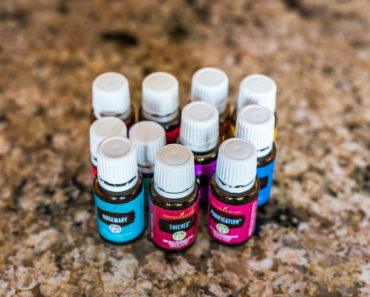 If you’re on a budget and you’re worried about this many drops for a large room, then you can always use a more affordable scent for 20 of the drops and then just 5 drops of a more expensive scent. Avoid using oils like rose if you are on a tight budget and want to use a lot of drops to for a spacious room. Many diffusers have a setting where you can choose from a heavy or light mist. When using in a big room, you should definitely go with the heavy option to get more mist in the air. Check your user manual because it can be tricky to know which buttons to push for this option (if your diffuser even has it at all). On the VicSting diffuser, for example, there isn’t a specific button for the mist strength. You have to press and hold down the mist button which is primarily used to set the number of hours for it to run. Once you press down then it will beep once for heavy mist and you can keep holding down for it to beep twice for a light mist. If you don’t hold down long enough then it will just change the time setting for how long it runs instead of the mist strength. It’s nice that the diffusers have modern designs without a ton of buttons, but it can make it more tricky to know about all the advanced settings they have available. If you are using garbage oil then you won’t have a strong scent covering a big area. It’s best to avoid super cheap oils that are diluted down with other chemicals and ingredients that shouldn’t be in there. Check out this guide on essential oil brands to learn more about which companies have quality oils. With the tips above, you can navigate the rapidly growing diffuser options out there and decide on one that fits your design tastes and works for a big area. Here are some recommendations with many high reviews to make it easier for you to filter through the hundreds of diffuser options out there. 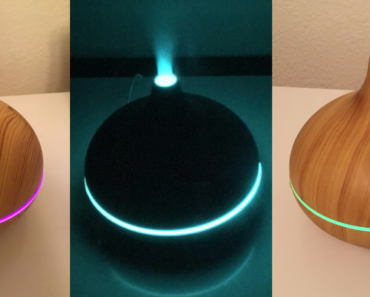 All of the recommended diffusers below have an auto shut off feature, rotating colors, run quietly, help humidify the room and produce a strong mist. You can’t go wrong with any of these diffusers so just determine what settings you care about and pick a design that meets your taste! 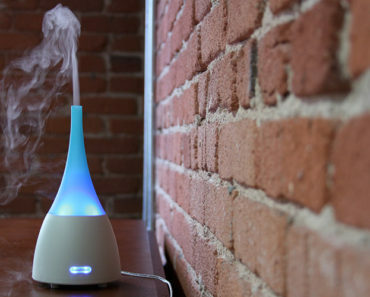 Size: N/A it’s a nebulizing not ultrasonic diffuser (meaning it doesn’t use water and mist like the ultrasonic type, but instead sprays pure essential oils into the air). Run time options: Raindrop only has one time setting and it’s an intermittent setting that runs for 2 hours. So it runs 2 minutes on and then turns off and “rests” for 1 minute in cycles for a total period of 2 hours. This is ideal for a nebulizing diffuser since these take more oils and it will save you money to have this intermittent cycle. It can cover up to an 800 square foot area. 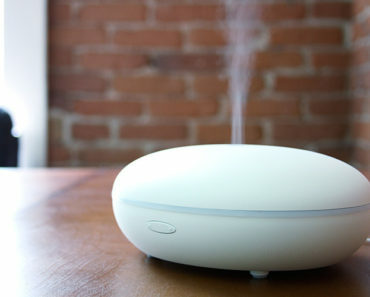 It sprays pure essential oils into the air so the scent is much stronger than what is produced by ultrasonic diffusers. It is better for realizing the therapeutic benefits of essential oils. Nebulizing diffusers are more expensive than ultrasonic types. It won’t automatically run for longer than 2 hours. (Hopefully this price is up-to-date, but it can fluctuate as sales happen). Run time options: 1 hour, 3 hours or 6 hours. This all around great diffuser has an amazing design that looks very modern and would look great in any room. It produces a strong mist that can permeate a big room. It even has a light mist and strong mist setting to choose from. It is high quality at an affordable price. You can change the color settings very easily and even turn off the glowing light completely (which is great if you want to use this as you fall asleep). The VicSting makes a soft beep when it auto shuts off. It isn’t terrible, but if you’re a super light sleeper and want to use the diffuser to help you go to sleep then it could possibly wake you up. I use it to fall asleep and my husband is a really light sleeper and it didn’t wake him up when it beeped, so it isn’t a problem for us but it is something to consider. The longest time setting is 6 hours which is low if you want it to run all day or night. Run time options: Intermittent or continuous. The intermittent cycle runs on and off every 30 seconds while continuous will run until the water is out (typically 4-6 hours). This is a powerful diffuser that really propels the mist throughout the room. Aromosoft has an intermittent setting so it can run continuously or cycle on and off every 30 seconds which is feature many people love. This product comes with a lifetime warranty so you can have peace of mind. You have less granular control over the time it runs because you can’t set a specific number of hours to run. The green light for the intermittent mist option and red light for the continuous mist option are pretty bright so this could bother you if you use it on your night stand next to you to help you fall asleep. Want more information on this product? You can watch an in depth review here to learn more about the AromoSoft diffuser. Run time options: 1 hour, 2 hours, 3 hours or continuous (will run until water is out). Its large 500 ml capacity enables it to run for 8+ hours in the high mist setting or 17 hours in the low mist setting so you can bask in essential oils all day or night! URPOWER offers a 45 days money back guarantee and 18 month warranty. The company has many great reviews for its customer service. It does make a beep when it shuts off which can be annoying if you want to run it at night. It is pretty quiet but it does have slight noise to it so if you want perfect silence at night then this might not be for you. Most diffusers will cover a 250-500 sq ft area pretty well but they won’t heavily cover any more than that. If you have a super big space and you want a strong scent, then just buy two diffusers. If you’re ok with a faint scent throughout a big area then one will do just fine!